A consideration of The New Yorker scribe's diverse canon. I first read A.J. Liebling while lying in a bathtub at the Château Frontenac in Quebec. It was an August evening, not yet half-a-lifetime ago, and I had spent the afternoon driving in the rain from Montreal in the company of a woman to whom I am no longer married. The days were already perceptibly shorter than they were at home in Massachusetts, and though the rain had broken by the time we arrived, the wind was up and the fading sun over the St. Lawrence gave an orange tint to the broken clouds. We were timid travelers. 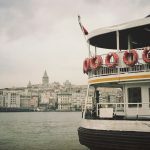 I remember worrying about where to put the car — there didn’t seem to be a parking lot, I couldn’t find the valet, and even if I had I wouldn’t have known how to tip him. But with our new graduate degrees and good jobs we took ourselves very seriously, and ate that night in the hotel’s most pompous restaurant. But before dinner there was the bath and the mini-bar, and a borrowed book to hold above the suds. I opened Between Meals and read Liebling’s account of Proust, whom I had not yet read myself: “The man ate a tea biscuit, the taste evoked memories, he wrote a book.” If only the Frenchman had had a real appetite we might have had a masterpiece — if all of that could come out of a cookie, just imagine what he could have done on “a bowl of clam chowder, a peck of steamers…three sauteed soft-shelled crabs…a thin swordfish steak of generous area, a pair of lobsters, and a Long Island duck.” Among other things, of course. I’ve edited that list down to size, down to what might last an ordinary person for a few dinners at least, and I can’t believe that even Liebling himself would have tried to get it all down in one sitting, though he was famous for being what he called a feeder. “The primary requisite for writing well about food is a good appetite,” he claimed, and there’s no doubt that his own appetite killed him. He was only 59 when he died in 1965 of heart and kidney failure, after a decade of gout and other troubles, and Between Meals has a respect for sheer capacity that we can’t share now. But the rest of his advice about eating — about learning to eat — still holds and the book’s endurance has other causes as well. It was no accident that Liebling started with Proust. 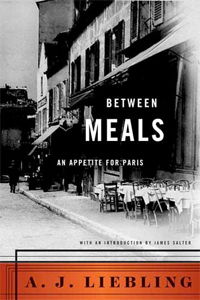 The volume he subtitled “An Appetite for Paris” is as much about memory as it is about food, a celebration of his own life in the lost paradise of the 20s — his 20s, and the century’s, too. Pieced together from a series of New Yorker articles, it appeared in 1962, two years before Hemingway’s posthumous A Moveable Feast. They had been young men in Paris at the same time, shared an interest in boxing and booze, and each covered the city’s 1944 Liberation. But the young Liebling lived a more thoroughly French life and kept away from both the expatriate world and the modernist circles that Hemingway described. Their versions of Paris barely touch, and while Hemingway’s portraits of Joyce and Stein and Fitzgerald do have an historical value there is no doubt in which city, in which man’s pages, I would rather live. Liebling was born and died in New York. Nominally Jewish, the son of a furrier, he was thrown out of Dartmouth for skipping chapel, and worked for newspapers in his home city and in Providence before persuading his father to pension him off for a year abroad. He took classes at the Sorbonne, but he concentrated his energies on restaurants and women; he had a taste for the semi-professional, and “sporting girls” would always figure among his regular sources. When he came back to the States he put in a few years on the New York World-Telegram, where he began his long friendship with Joseph Mitchell. Both of them joined The New Yorker in the mid-1930s, and their beats at first stuck close to the kind of New York street life they had covered for the paper, Mitchell concentrating on the Bowery and Liebling on Broadway. Each writer’s first book — Mitchell’s My Ears Are Bent and Liebling’s Back Where I Came From — appeared in 1938, and took most of its material from the newspaper work. Each writer eventually found himself a doppelgänger. Mitchell followed the career of Joe Gould, a down-and-out Harvard man and amateur historian, always at work on a manuscript that was eventually found to be blank (an uncanny foreshadowing of Mitchell’s own blocked last years). Liebling’s double was a con-man and racing tout called Colonel Stingo, who wrote a column for National Enquirer. He described the Colonel as his favorite writer, but his accounts of Stingo brought out a quality of florid sentimental hyperbole that is, to me, the worst thing about his work; Guys and Dolls with a very squishy belly. His own language would never have neither the mordant elegance or the concentrated symbolic force of Mitchell’s best essays, like “Up in the Old Hotel” or “At the Bottom of the Harbor.” But he had a far greater range, a tactile pleasure in the physical world, and a sense of history that allowed him to make one moment, one era, fall into another in a way that even Proust would have respected. He was married three times and divorced twice. His first wife spent a large part of her life in mental institutions. His second took most of his money. His third was an alcoholic named Jean Stafford, with whom he was happy enough. Most of her own best work was behind her when they met in 1956, though she would win the Pulitzer in 1970 for her Collected Stories. It is strange to think of the same woman marrying both Robert Lowell and A.J. 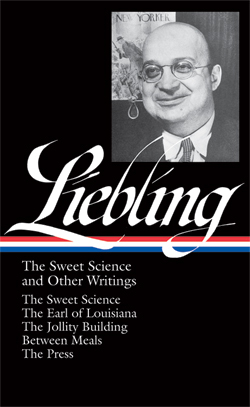 Liebling, who liked to downplay if not deny his own intellectual sophistication. He stayed at The New Yorker from 1935 until his death, writing about newspapers and New York cigar stores, General de Gaulle and the fighter still called Cassius Clay. The standard line — his own line, in fact — was that nobody better could write faster, and nobody faster wrote better. Liebling’s books went in and out of print, and so he would have liked the streetwise eulogy Mitchell gave him, in which he quoted the proprietor of a second-hand bookshop. Literary critics and historians might not know what would last, the bookman said, but he did. A used bookseller knows which books have life, which can be “read and reread and reread,” and over the years so many people had come in looking for Liebling that the man had started to keep a waiting list. To Mitchell that meant that though “Joe is dead…he really isn’t. He is dead, but he will live again,” and over the years he has shown many signs of standing up again. I first read him in a 1981 compilation called Liebling Abroad, edited by his biographer, Raymond Sokolov; there was a companion volume called Liebling At Home. More recently David Remnick put together a book of greatest hits, Just Enough Liebling, and over the years there have been various editions of individual books, usually Between Meals or The Sweet Science, his 1956 collection of boxing pieces. Now the Library of America has given him the permanence that long-ago Fourth Avenue book dealer foretold, in two of its handsome black-jacketed volumes. 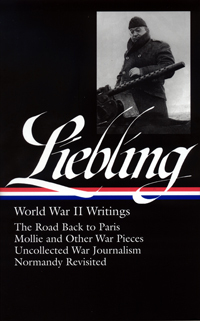 World War II Writings begins with Liebling’s first important book, The Road Back to Paris. Published in 1944, it opens with an account of the Phony War and the fall of France, and ends in North Africa with the initial engagements between American and German forces. Mollie and Other War Pieces (1964) is a posthumous gathering of articles written during the war’s second half. is for me Liebling’s richest and most affecting single book. It does what its title says, only it starts in England and ends in Paris, and includes his memories of entering the city with the Free French forces who liberated it. As separate volumes, these would each have a claim on our literature. But they gain a cumulative force from being bound together here, and from the decision to supplement them with over 200 pages of Liebling’s otherwise uncollected pieces about the European theater. His writing throughout these thousand pages observes the conventions of its day, or most of them, in its depiction of gore and representation of soldiers’ speech. But then George Eliot followed the customs of her time in dealing with sexual questions, and her work is not less true because of it. No American war reporter has left us a more comprehensive record; this is the book that deserves to be his monument. I wish I could recommend the Library of America’s second volume with equal force, but the house preference for selecting complete books wherever possible has led to some difficulties. No argument about The Sweet Science or Between Meals or his lively picture of Southern politics in the last days of Jim Crow, The Earl of Louisiana (1961). But though The Press may be Liebling’s most important single volume of what’s now called media criticism, it draws on some twice recycled pieces from a couple of his earlier collections and doesn’t contain all his best work in that area. I missed, for example, his memorial essay on Harold Ross, The New Yorker’s founder, or his shrewd and funny analysis of the obituaries of William Randolph Hearst; Remnick includes them. Still, it has a special relevance today. 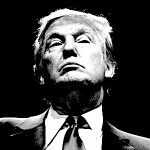 “The country’s present supply of foreign news,” he wrote, “depends largely on how best a number of dry goods merchants in New York think they can sell underwear,” and his words now look more true than ever as advertising revenue dries up and newspapers around the country cut back or go into bankruptcy or fold. The day I read the book’s opening section, “Toward a One-Paper Town,” The New York Times ran a piece speculating about which major American city would be the first to lack a paper of its own. Liebling wrote that “Freedom of the press is guaranteed only to those who own one,” and I suppose the final freedom of ownership is to decide that the press is something we can do without. It is, by the way, a shock to find those words — Liebling’s single most famous line — in their original context. They come in a parenthesis — an interjection, a throwaway, a wisecrack that happens to be true. Writing on deadline means that you don’t always recognize your own diamonds. Liebling didn’t invent The New Yorker’s fascination with work, with letting its interview subjects explain what they did for a living. But he did it very well, and his pudgy hand sits comfortably on the shoulders of the next generation, writers like Roger Angell or John McPhee. They are all of them purveyors of non-essential information, and the enormous pleasure we take in them is in inverse proportion to any actual need we have to know. Angell’s baseball writing in particular seems to me inconceivable without the precedent of Liebling on boxing. Still, there are differences. Neither Angell nor McPhee are at all shy about the first-person, but they both have the ability to disappear within a story that Liebling either lacked or didn’t want. Liebling was never not a part of the story. He might have been listening to the trainer Whitey Bimstein describe how he fixed a fighter’s cuts, but he himself was always there, a presence, a participant, a character. At the same time, Liebling always refuses to take his own psyche as his subject, however much he might draw upon his own tastes and memories. In this he differs from a writer like Joan Didion, whose work in covering the coverage of politics makes her in many ways his successor. Of course Didion is not a “New Yorker” writer, even though she does write for it. Liebling could never be identified in any other way, and the attempt to say what one thinks about him is also an attempt to define one’s feelings about the magazine itself. Watching Joe Louis fight at the Polo Grounds in 1951, Liebling writes that he “hadn’t seen Louis with the naked eye since we shook hands in a pub in London in 1944.” The Sweet Science often dives into memory. Between Meals is about memory, and in rereading it this spring I found that I’d forgotten how little of it is actually about food. I had a distinct recollection of whole paragraphs that happen not to exist, and had no memory at all of the bar girl Angèle, with whom it ends. But I did remember the crucial part, the chapter called “Just Enough Money.” Liebling argues that rich people never learn how to eat because they never have to make trade-offs — scrimp here to splurge there. If I could always afford good Burgundy, I wouldn’t know how much I like Beaujolais. And Liebling could have put that into an equation: To get a bottle of Burgundy that will give me an equivalent pleasure, I have to spend X times the cost of my favorite Beaujolais…with a different figure of course for Chianti or Chinon. So you need to have just enough money to get by — “funds in hand for three more days,” he writes, “with a reasonable but not certain prospect of reinforcements thereafter.” Not desperate, but not entirely flush either. Maybe this isn’t so true anymore, when people will spend large sums to fly over and eat street food in Singapore. But within a given city I think it holds, though usually we make the choice by electing one category of restaurant over another. The need to calculate the price-quality ratio is what sends graduate students to ethnic joints, and once you’ve eaten the Mexican tripe-and-hominy stew called menudo very little will look strange. Liebling offers another tip from the year of “early research” that he spent in Paris, a bit of folk-wisdom passed on from an older man. Any restaurant where you see priests eating in a group, or hookers eating with hookers, is likely to be good: “those are two classes of people who like to eat well and get their money’s worth.” The strange thing is that my grandfather gave me the same advice when I was 13, albeit suitably adjusted for my age and our small town milieu. Priests and cops, those were the tip-offs — priests in a group, spending their own money and not a parishioner’s. Now I’ve never seen a group of cops sitting down over more than a diner sandwich, and groups of priests are today a rare sight. And yet once in Rome we did sit down next to a group of seminarians: clean-shaven 20-somethings all of them, a couple in their collars and the others in crew-neck pullovers, boys who seemed to be at once earnest and laughing. I suppose you could even call them graduate students — and the meal was good enough to make me think Liebling was right. The boxing, the Burgundy, the ease in talking to private soldiers and generals alike, the friendships with Camus on the one hand and cigar-store bookies on the other, the understated confidence — the character Liebling projects seems a model of mid-century worldliness. There are other models for such masculine assurance, of course, and neither in person nor on the page did he have the bravado of Hemingway or the elegance of Cary Grant. He is just a guy what knows his way around. Literature is news that stays news, as the saying goes, and in the middle of the century a lot of that news was, well, news. Randall Jarrell called it an age of criticism, but we could also call it an age of prose. The years from Let Us Now Praise Famous Men to The Armies of the Night — years that roughly correspond to Liebling’s own career — stand as a defining period for what we now call the non-fiction narrative. At the end of that time people began to describe it as the “New Journalism,” but Liebling himself would have said there was nothing new about it. 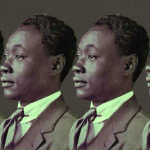 He would have remembered Hazlitt, or the boxing writer Pierce Egan, and even his good friend Mitchell, and probably he would have kept his distance from the kind of prose associated with Tom Wolfe or Hunter Thompson, for whom style is a mode of display. The Library of America has already recognized the way in which reporting became literature with its volumes on Civil Rights, Vietnam, and World War II. Liebling is the first reporter to have his own entry, though I doubt he’ll be the last. Of course he was more than a reporter. He was a memoirist, a critic, a sensibility, and at times he thought he’d wasted his gifts on deadlines. But greatness in any field is rare, and what fiction he left showed no sign of it. His war correspondence does. The war was the biggest piece of news in his lifetime. I’ll remember his account of D-Day for as long as I can read, but what most astonishes is the sheer range of things he writes about. 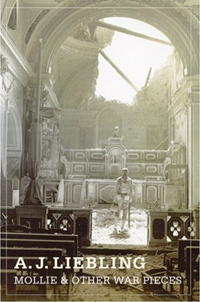 In “The Events at Comblanchien — November, 1944,” he pieces together the mixture of confusion and malice and fecklessness that led to a German massacre in French village. He crosses the Atlantic one way by bomber and another by a “Westbound Tanker” — one of his most famous pieces — and along the way comes to know war’s mixture of boredom, urgency, and fear. He visits the Jewish quarter of a Tunisian city and attends the first press briefing delivered by General Omar N. Bradley. He tells us how the French underground press worked throughout the Nazi occupation and how a fighter squadron operates and of what it was like, in August 1944, to live “for a week in a great city where everybody is happy.” At the end of Mollie and Other War Pieces he writes that he has resisted the temptation to provide a conclusion because “war, unlike drama, has no unities, classical or otherwise. It is discursive, centrifugal, both repetitive and disparate.” Yet his own war did have a shape. He went home at the end of 1944 and felt “ashamed” that he missed the Battle of the Bulge, but his interest had effectively ended with the liberation of Paris. It was where he had been at its start, and once he had traveled the road back it was time for other things. Michael Gorra teaches English at Smith College. His books include The Bells in their Silence: Travels through Germany and, as editor, The Portable Conrad.